I have often been asked “is Amazon affiliate program a scam?”. You may be asking yourself this question and I am glad that you have landed on this totally unbiased review. You most likely have come across the term “Amazon Associates” right? Well to get it straight, the “Amazon Associates” are the people that have joined the “Amazon Affiliate Program”. So, whichever way you want to call it, you would be right. But the purpose of this review in not to discuss those that have joined the affiliate program, but the affiliate program it self. That said, is the Amazon Affiliate Program a Scam? Or is it a safe program to get involved with? This is what we are going to find out in this review. Of course, as for any affiliate program reviews out there, you must be very careful with placing a judgement. As you will find 3 kinds of people who will have something to write about it. Those who will tell you that it is a scam, and if you dig in, you can be sure that it is simply because they have failed. On the contrary, there will be a handful number of those who have followed to program properly and gave it time to work, and who will tell you that it is a great program to work with. Then, the worse of the lot: those that have never given it a try, and even don’t have a clue of what it is about, but are just writing reviews after reviews; either positive or negative; in order to lure their readers into joining that particular program; or another affiliate program that they are promoting and are a member of. So, for your benefit, and the benefit of my readers, I am going to give you a complete and totally impartial review of the Amazon Affiliate program. Is Amazon Affiliate program a scam?.. … or is it really legit? 4 – Why is Amazon Associates still a great affiliate program? 5 – Should you signup for an Amazon Associates account then? It is known that many affiliate marketers don’t particularly like Amazon. Some even go as far as saying that the Amazon affiliate program is a scam; or, those that are not so cruel only say that it is not worth the trouble and time to have an account with them. To be fair, let me say right now that it is definitely nowhere being a scam. As an affiliate program, I must admit, it is probably not the best to be involved with out there. But it has a fantastic track record and it is already well established. Plus, you will find that a relatively easy program to be working with. To be honest with you, I am an Amazon Associate. I have several websites like this one with some Amazon ads running on them. Although, it is not one of the affiliate programs that earns me the best income. But rather than leaving some money on the table, it does what it says on the tin and it doesn’t require much maintenance. Now, one thing that you might have learned is that you need a website, right? On the link I have given you above, it suggest that you can have a “Blogger” blog. Well, let me tell you right now, DO NOT waste your time with a free “Blogger” blog! The main reason being that it will never be your own domain; it will forever be a sub-domain controlled by Blogger. They can shut you down at any time, for no reason, and your time will be wasted. It happen to me several times. It is really frustrating! Plus, no-one is very keen in buying stuff off a free website or blog. It doesn’t look very professional. Some people complain that they are sending traffic to the products that they are promoting, but their stats doesn’t seem to register the clicks: Personally, as I say above, I promote Amazon products on my websites and blogs only as a secondary income, so I have never paid attention to these statistics. On the contrary, some claim that they seem to receive more clicks than they think they should have. There is some true in here. It has been proven that Amazon tend to encourage new associates by giving them more clicks that they should record at the beginning. There are complains that Amazon would close the accounts of those who are making too much money. This is a complete lie that is spread around by those who are trying to cheat the system. I wouldn’t understand why they would not like you to get them to earn a lot of money. Who wouldn’t want to? The Amazon Associates payment scale is not at all worth the trouble. Well, it costs me nothing, financially or in time, to have a few Amazon ads on my websites and blogs. But at the end of the month, I still rake a couple hundred dollars, doing basically nothing. But, is amazon affiliate program a scam? In total honest, no-one can say that. Although, some people will say it, but as I said at the start of this review, they will be those that have failed. It really all depends on the products you choose to promote on your website or blog. You will have some products that are on high demand and will sell themselves, but they might earn you less commissions than others. Personally, I am not stressing on what sells well or not. I have a few niche websites and promote related products and what sells is not really something I am pressing on. But from time to time I sell products like robot vacuum cleaners, and health products. That makes me some extra bucks at the end of the month. It is not my #1 source of income though, by far! But, as Amazon is the largest online retailer, just about everyone buying online already know and feel safe when ordering their products through Amazon. Therefore, it is no problem for Amazon to pay their Associates at a lower percentage of commission, because they already own over 60% of all the sales that are done online. So, the are not chasing customers, customers are coming to them naturally. Which means is that I can earn more in commissions when selling one of Amazon products than I would from selling some products for another company who is offering a better rate of commission. See what I mean? People trust and shop at Amazon. They are know to have great prices and best deals, therefore, they receive more order than any other online retailers and affiliate programs. In the end, I could earn more with Amazon if I were to concentrate on that, than with many other affiliate programs. It is one of my plans for the future though. Amazon has become the first brand that comes to mind when we think about making some online shopping. No other firm online knows how to operate an eCommerce better than Amazon. People trust Amazon as it has been operating since 1994 with an excellent track record, from the point of view of the buyer, as well as the seller. 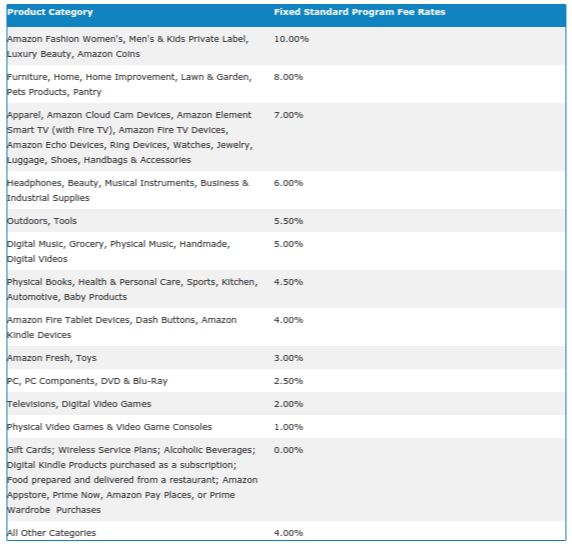 There a far more products available on Amazon than on any other online shops. Because of their good reputation and their sales volume, you have a much better chance of making a sale when promoting their products than if you would promote products from some lesser known affiliate programs. Everyone knows who is Amazon. They are worldwide. People prefer to buy from them rather than from anyone else online. I make sales from my various niche websites in various countries, such as France, Canada, Germany and the United Kingdom, not just in the US, where my main account is registered. I could also make sales in other countries where Amazon is opening their Affiliate Program, if I would have sufficient traffic coming from those countries. Their products sale themselves thanks to theirs page layout. Their images layout, the detailed product facts, buyers’ reviews, and, of course the competitive prices. All that works in your favor as an Amazon Associate. Their customer service is excellent, both for the Associates as well as the shoppers. I receive a commission even on upsells: For example, if someone clicks on an Amazon product that I am advertising, buys it, then decides to purchase another product that Amazon is suggesting, I receive a commission for the second product as well. This is why my reports show that I have made sells of some products I have never advertised. They operate on a 24 hours cookie system. Meaning that if someone comes to Amazon through one of your links, doesn’t buy the product, but comes back within 24 hours and buys that product, or any other one, you will be paid a commission on anything that they buy. Amazon definitely knows how to sell. Display honest reviews from customer who have actually purchased the product (good and bad). and an easy way to add products to your cart. Getting visitors to Amazon through your affiliate link is not as easy for you as it is for Amazon to convert your visits into sales. In total honesty, I would say YES! Although there are complains from some people. There has also been reports of issues between Amazon and their Associates, but let’s be fair, there are by far more positive feedback from users, and from my experience, they are great. There are so many perks for Amazon Associates. I have mentioned just a few in this review, there are many more. And if you are new to affiliate marketing I would highly recommend that you start with Amazon. It is easy to signup as an Associate, and they don’t have many difficult requirements as some other online stores may have. But the main reason why I recommend the Amazon affiliate program is that Amazon is now a household name, everyone shopping online knows Amazon. They have a lot of products on their shelves (over 536 million as of August 2017) and are constantly adding more. Online shoppers also trust them far more than any other shopping platforms. The Amazon brand is on everyone’s lips. There are less issues from them compared with less known online retailers. Today, Amazon US sells over 606 million products! Their operating agreement is quite complex, but if you take the time to read it and to stick to the rule, and you should have no problem. So, is Amazon Affiliate program a scam?.. Definitely NOT! So, is amazon affiliate program a scam? I guess that you will agree with me, it is definitely not a scam. If you have any experience in this particular field, my readers and myself would like to hear from you. Should you have any problems and would like to find a solution, please make use of the box below. I normally respond within 24 to 48 hours. If you enjoyed reading this article please share it socially and post your appreciation in the comments area below, I will highly appreciate it! Great article. I like how clear and concise everything was written. I am actually a member of Amazons affiliate program and while I can attest to the commissions earned being on the lower end, I still believe it’s a solid opportunity due to the fact that they just have sheer volume over everyone else. I know there are tons of affiliate platforms out there to choose from so there’s no need to limit oneself to Amazon but it is definitely a solid opportunity fr those who are on the fence. Thanks very much for visiting my website Corey, and for taking the time to comment on one of my scam reviews “Is Amazon Affiliate Program A Scam?”. I am also promoting Amazon products on my websites and do enjoy a few sales now and then. To tell you the truth, I prefer promoting Wealthy Affiliate which has the best training program on the Internet. It is also free to join, so very much suitable for newbies as there is zero risk involved. The income potential is also by far better than that of Amazon.